Samantha is an all-around lover of the great outdoors, spending her time mountain climbing, rock climbing, skiing and now surfing. She’s based in Squamish, BC. On the Pacific Coast, it’s hard not to crave the clamour of the ocean and relish the escape of a stormy afternoon. Storm watching is an easy excuse to slow down, to let the waves do the raging and take it all in. But what do you do when you when you bunker down for a storm and wake up to sunny skies? 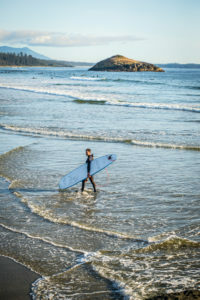 On my recent Tofino trip, I chose to embrace it and roll with the waves. Saturday morning sunbeams were seeping from the sky. The fluke of fair weather was a surprise, but how could I complain about sunshine in a place like Tofino where the opportunity for adventure is endless. So I ditched my rain jacket for a wetsuit and set off to make use of the playful waves at Long Beach. I’m a sucker for cold weather and was daunted at diving into the Pacific in November. But armed with a full kit of neoprene—a wetsuit, gloves, boots and a hood I legitimately felt warm. My hair even stayed dry underneath my second skin. Part of the Tofino experience is sampling the local fare, and for me, Tacofino and Tofino Brewing Company were a welcomed treat to close out the day. The next morning clear skies were in the forecast, it was the perfect opportunity to catch a legendary dawn-tinted Tofino sunrise. At 7:15 am there wasn’t another soul on Wickaninnish Beach, and the coastline came alive with a spectrum of colours whetting my appetite to see more. 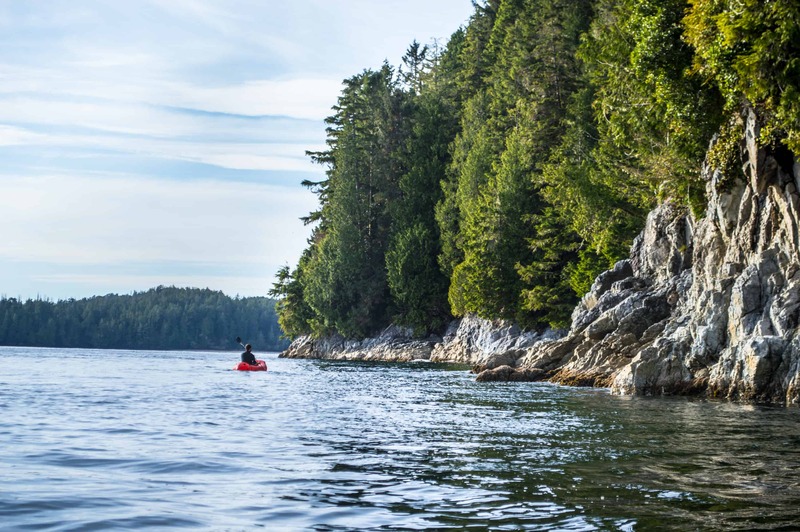 While surfing offers striking views, plenty of Tofino is best viewed from the calmer side of the coast paddling outwards from downtown. After catching sunrise, it was easy enough to visit local shops and galleries in the morning then head to the docks to paddle to Felice Island in the afternoon. In less than two hours roundtrip I spotted a few harbour seals and saw a handful of colourful kayakers gliding through the good weather. I’m a frequent visitor of Tofino in summer but the colder months tend to bring out the teal in the ocean making for even more opulent sunsets. Despite the stormless skies I spent the evening watching the waves lap against the shoreline. 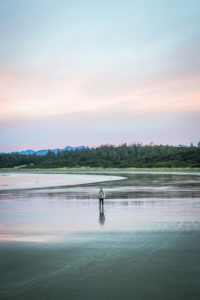 Storm or no storm, Tofino is the ultimate place to watch the sun go down.